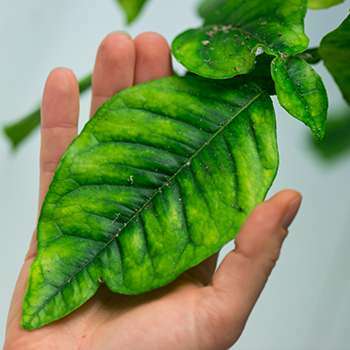 A citrus leaf infested with Asian citrus psyllids shows signs of citrus greening disease. New research from the Boyce Thompson Institute (BTI), the USDA Agricultural Research Service and the University of Washington finds that helpful bacteria living inside the insect that transmits the bacterial pathogen associated with citrus greening disease - -an outbreak that is devastating Florida's citrus industry—may be playing a role in the insect's spread of the pathogen. A new study of the citrus greening bacterium's effects on its insect vector, the Asian citrus psyllid, reveals multiple changes within the insect. During the infection, the pathogen affects the 'good' bacteria living inside the insect and alters the psyllid's metabolism in ways that could help spread the pathogen further. Ultimately, the study may reveal weak points in the transmission cycle that could yield novel and highly specific targets for control strategies. These approaches could be more effective and environmentally friendly than large-scale pesticide use. The study appears in the journal PLOS ONE. "Our work in this area could not be more timely," said Michelle Cilia, an assistant professor at BTI and research molecular biologist in the U.S. Department of Agriculture's Agricultural Research Service. "Last week, the USDA's National Agricultural Statistics Service lowered its already dire projection for orange production in Florida. The catastrophe faced by Florida growers is a direct result of citrus greening disease. This shortage will affect every single American who consumes citrus products as part of their daily diet, so we are really racing against the clock." Citrus greening disease is a deadly bacterial infection of citrus plants that causes the tree to produce bitter green fruits. It is associated with infection by a bacterium called Candidatus Liberibacter asiaticus (CLas). There is no cure for the infection and currently, growers slow its spread by controlling the insect that carries it, the Asian citrus psyllid, with pesticides. "There's certainly a lot of concern about beneficial insects and honeybees when you talk about combatting citrus greening disease by simply using more insecticides to kill the insect," said John Ramsey, a USDA postdoctoral associate in Cilia's lab. "One of the most appealing aspects of a target is its uniqueness to this system, because then you don't have as much to worry about with off-target effects." To better understand what changes occur in the insect during infection, researchers in Cilia's lab worked with researchers in Michael MacCoss' lab at the University of Washington in Seattle to compare all of the proteins inside the body—called the proteome—of infected and uninfected psyllids. The analysis revealed that the psyllid responds to the citrus greening pathogen not as a harmless hitchhiker, but as an infection, which triggers the insect's immune system. The infection also causes the insect to ramp up production of certain metabolic enzymes, which break down glucose and fatty acids. The researchers suspect that CLas induces metabolic syndrome in the insect and may be manipulating the insect to change its feeding habits, thus increasing its chances of spreading, but behavioral studies will be needed to confirm this idea. The proteome experiments also show that CLas infection affects the helpful, symbiotic bacteria that live in the insect. Psyllids and other sap-sucking insects have long-standing relationships with bacterial partners, which help transform their sugar-rich diet of sap into usable amino acids. The Asian citrus psyllid houses a novel bacterium not found in other insects, called 'Candidatus Profftella armatura.' Though the bacterium's role in the psyllid is not yet well understood, it is known to produce conspicuously high levels of a metabolite called a polyketide. 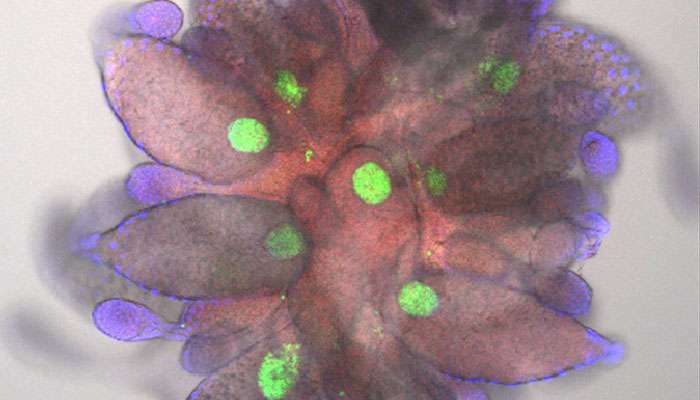 "We saw that a large number of Profftella proteins, including proteins involved in polyketide biosynthesis are upregulated in insects that have acquired CLas," said Ramsey. "The data indicate that Profftella could be playing a role in CLas transmission by the insect." While other researchers have shown that this polyketide, which is unique to the Asian citrus psyllid, is toxic to animal cells, no one knows if it has antibacterial effects. Co-author Jason Hoki, a Cornell University graduate student working in the lab of BTI Associate Professor Frank Schroeder, quantified the levels of this polyketide in infected and uninfected psyllids. In the process, the team identified a second type of polyketide and found that the quantities of the two related compounds change after an insect becomes infected. In future work, researchers in the Cilia lab plan to further explore the function of these polyketides in the insect. The protein work conducted in the Cilia lab also feeds into their collaboration with bioinformaticists in Associate Professor Lukas Mueller's lab, who are annotating the genes and other genetic regions in the recently sequenced genome of the Asian citrus psyllid. This work is part of a large USDA Specialty Crops Grant focused on the development of molecules that physically interfere with CLas transmission by the psyllid. By investigating the multi-faceted interactions between the symbiotic bacteria, the Asian citrus psyllid, the citrus plant and CLas, the researchers hope to develop treatments that can block key proteins in the pathogen transmission cycle, which will be more effective than pesticides. "We're probing all of these interactions to find the best tool to support citrus growers and help them fight this disease," said Ramsey. The study also brings up an interesting evolutionary question: Which host came first, the psyllid or the citrus plant? "Was this an insect pathogen that became adapted to a plant, or is it a plant pathogen that has found a way to infect the insect? We don't know, but it's one of the fascinating elements of CLas, the citrus greening pathogen."